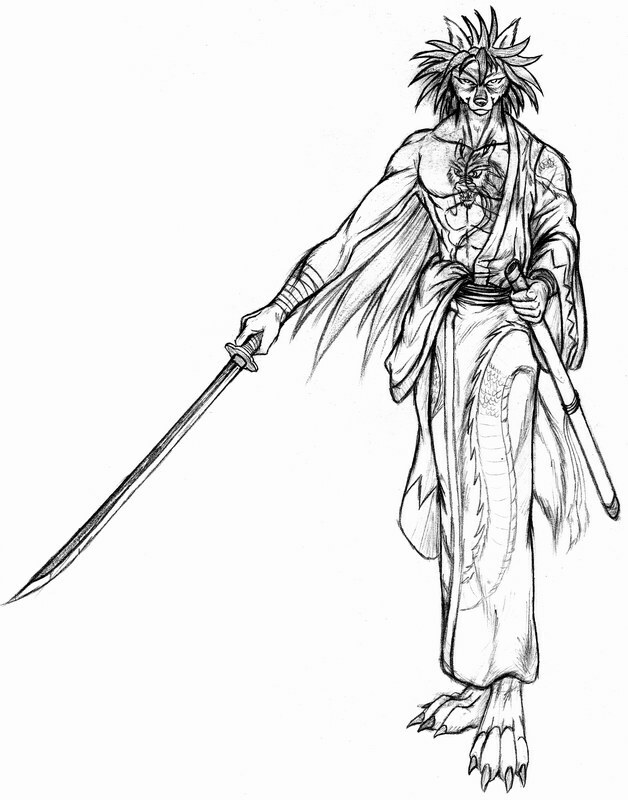 General Appearance: Kotetsu Sakkaku is a unique werewolf, seeing that he has more of a humanoid build than the others of his clan. 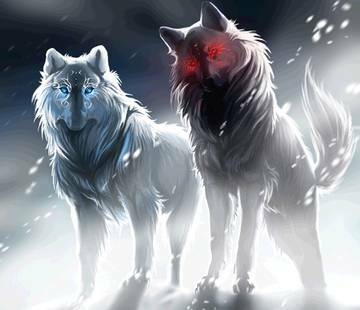 Although having a humanoid appearance, he still has hardened claws, wolf ears, and a ghost white tail that splits at the end; the split tail can make an illusion of him having multiple tails. His build is a slim yet muscular build while standing on the rather larger size of average people at 5'10. While seeming somewhat tall to a human, he is rather small for a werewolf. The shinigami's hair is a ghost white color consisting of medium length messy style. His eyes are two different colors, the left being a vibrant scarlet while the right a sky blue; the reason being is a genetic condition called Heterochromia iridium which results is different iris colors. His shinigami uniform consists of a black hakama with a solid white undershirt. The shirt over that is a ghost grey with vertical black pinstripes. Kotetsu's captain robe is different than the usual one, being that it is a deep and dark Burgundy/Maroon color with the traditional 3rd division symbol on his back along with two flower symbols on each sleeve. The reason for the odd colored robe was due to him wanting a symbol to remenber his time in the Onmitsukidō. Kotetsu has an assortment of tattoos that can be located on multiple parts of his body. Back when his Zanpaktou lied about his name and image, the young werewolf got two Tattoos of the spirits on each arm. Shortly after that, his father was murdered and he got another Tattoo. This one consisted of his fathers paw print and was located over his heart on the left side of his chest. 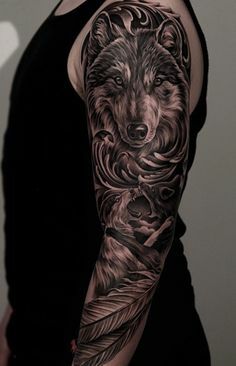 Then after unlocking his true bankai, the shinigami went and had a tattoo of a yin and yang wolf; this was in order to symbolize the understanding and unification of his Zanpaktou. Extremely Loyal-Once considering you his close friend he may look upon you as family, and will be willing to protect said people to any extent. Meticulous-Being the Captain of the 3rd Division, he is very thorough when conducting missions/operations. Informative-Being the head of the Intelligence Division, he is usually the one to seek when needing any information. Philosophical and Wise- Since a young age, Kotetsu was very interested in the world outside of his clan. Whether it be the Soul Society in general, the seireitei itself where the Gotei 13 presided, or the world of the living; they all fascinated him. Which in turn lead the young boy to read many books and pick up alot of philosophical ideas, sayings, mentalities and even grow in wisdom. Adaptable-Since he was always the odd one of his clan, the humanoid werewolf was always forced to adapt as a necessity. Although being the outcast of his group, it did aid him but also inhibited him at times. Given his humanoid appearance, Kotetsu is able to cover his ears and tail, and for the most part is able to hide his werewolf identity. Then again having this humanoid appearance can be a curse, seeing as not only his clan but the other werewolf clans among the Soul Society would look down upon him and probably be more aggressive or hostile towards him. Wrathful- He is a pretty peaceful person, but once angered enough by usually specific reasons, can cause him to lose his cool and seem to be driven by animal instincts and unbridled wrath. At this point his preference of despising bloodshed goes out the window. Stubborn- Once certain of something, Kotetsu can be quite stubborn. Seeing as he bases his logic and conclusions off of information and facts, and will even disobey a direct order if he really felt it necessary. Eccentric- Some find his mischievous attitude odd, or even eccentric. Which in turn can make people uneasy. Inquisitive Nature- He is a very curious person and sometimes, tends to ask plenty of questions. This can come off as annoying or even over whelming. His people's outlook on the Gotei 13. People abusing their power, especially if to oppress others. He tends to constantly have a mischievous or sly grin, for the exceptions of when being serious or mad. Since he despises meaningless bloodshed, Kotetsu usually attempts to restrain from using excessive or lethal force, unless deemed necessary. To mend the dilapidated relationship between the Aniwaya and the Gotei 13, as well as reduce the animosity and acrimony between the two groups. General Personality: He is not indiscriminately violent, as he shows no desire to needlessly attack others who pose no threat to him or his ideals. At the same time, he genuinely cares for the people he trusts, especially if he considers you his friend,whom he treats as equals even if he is their leader. Mainly because in his eyes if you are his true friend then you are his family. He is clever and innovative, able to plan quickly and efficiently, as well as charming and charismatic when he needed to be, enabling him to sweet talk his way into homes or strike deals with people. He is intelligent and patient, though he is also capable of ruthless violence.Although generally composed, he can lose his temper in complete defeat. He feels the need to blame corrupt leaders to be the cause of the greatest imbalances in the world. He feels that it is the corrupt leaders of both the Gotei and his clan that feed the people false information to create the tension between the two. Something Special: Being a werewolf, Kotetsu has hardened claws, as well as enhanced hearing and smelling. Zanpakutō Name Translation: Anger/Wrath of the twin fangs. Sealed Zanpakutō: The zanpaktou is a rather plain looking katana. 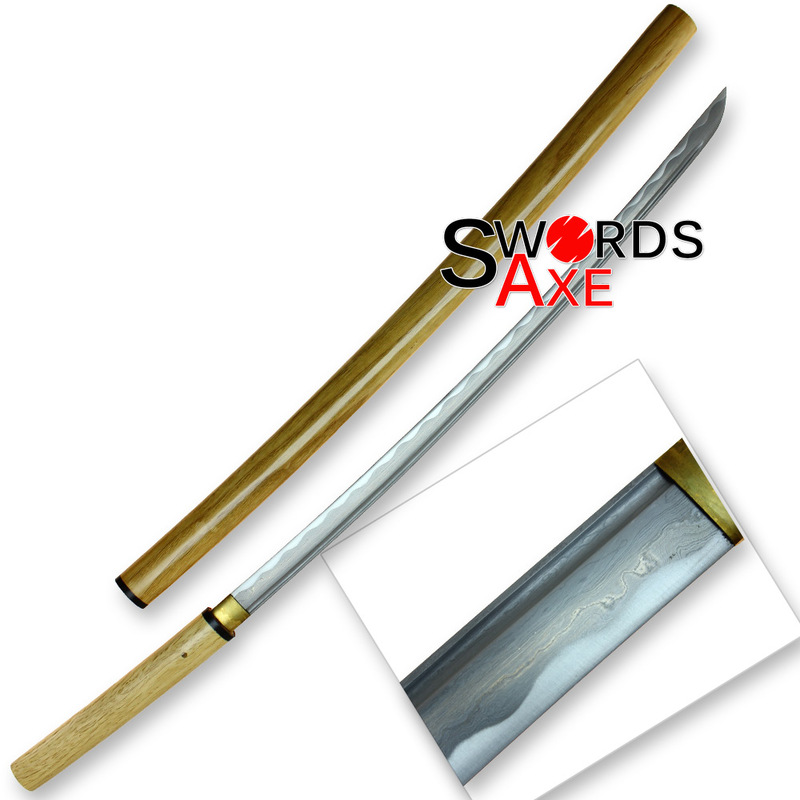 Albeit the handle and scabbard is made from stained Allocasuarina luehmannii or Australian buloke which is the hardest ironwood, while the blade is a reverse blade made up of high quality Tamahagane steel. The blade is jet black. Effects/Ability: The ability to generate and manipulate fire to an extent. It can generate a arcs of fire with slashes and a stream of fire with thrusts. The size and continuation of it depends on the amount of energy put into it. Though able to generate fire, once leaving the blade it can not be manipulated any further by said blade. 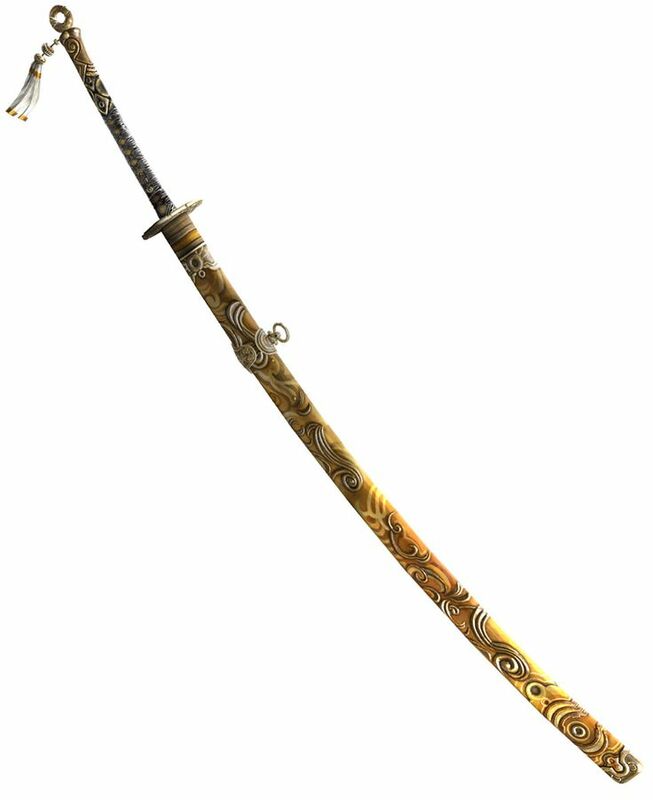 False Bankai Appearance: The false bankai is a dual edged sliding sword. Effects/Ability:[/spoiler]The blade is enveloped in an extremely dense pressurized shell of super heated flame that is constantly and furiously moving. The flame gives off no heat unless touched, which is called an adiabatic flame. The shell itself is barely visible and extends the blade's tip 2-3 inches while making the cutting edge an extra half inch. The technique got its name from this shell, seeing as it appears whatever the sword touches begins to melt through or caught fire if flammable. The sheer heat begins to melt away at the object being cut while the wind's constant movement begins to erode away the melted slag as well as reduce friction and increase cutting or piercing potential. If concentrating, the user can send arcs of the super heated air at the oppoent. The arc itself it as sharp as a blade and will set fire to flammable material. Although doing so causes it to be more visible. With this technique activated, the blade's shell is as hot as an oxyacetylene, which is 3300°C or 5972°F and can cut through Shikai and below zanpaktous. 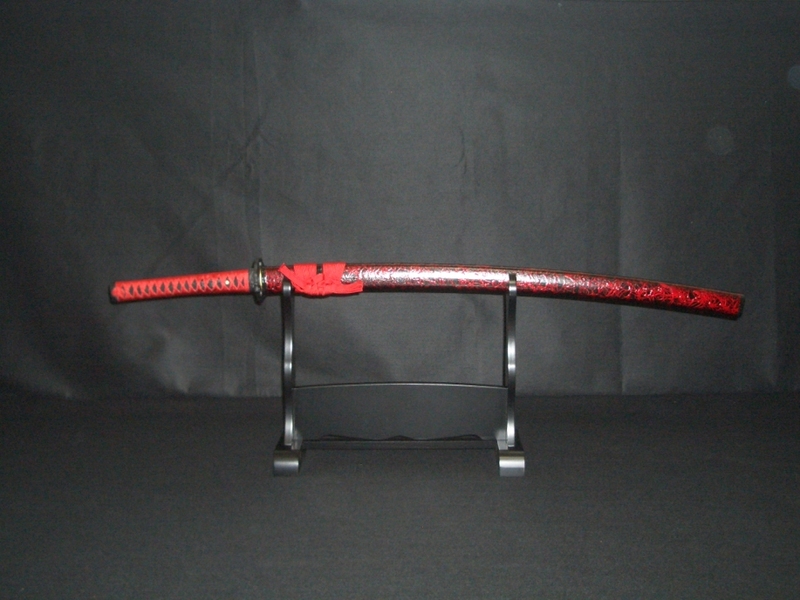 Bankai Appearance: The Short Nodachi with the sheath. Bankai Ability: This form grants full mastery over all aspects of fire as well as the ability it is known for. False Spirit Appearance: Left is Fury, and right is Rage. Inner World: This Zanpaktou's inner world is a barren rocky desert that is centered around an active volcano. The flooring of the ground is mostly hard except for the exceptional patch of loose sand, as well as it is covered with crevices filled with lava/magma which flow directly from the volcano itself. 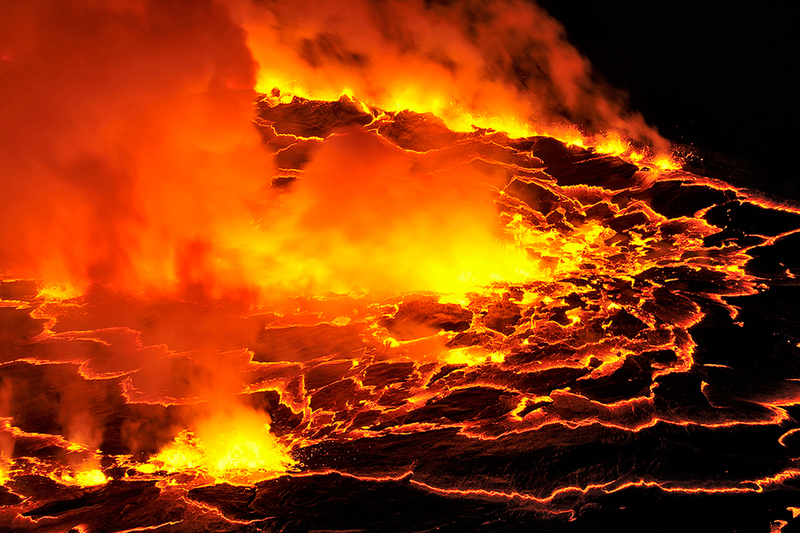 The weather seems unbearable, due to the immense raging heat produced by the flow of lava. As well as the furious gales of wind which carry pockets of sand and feel as if it is eroding away at your body.